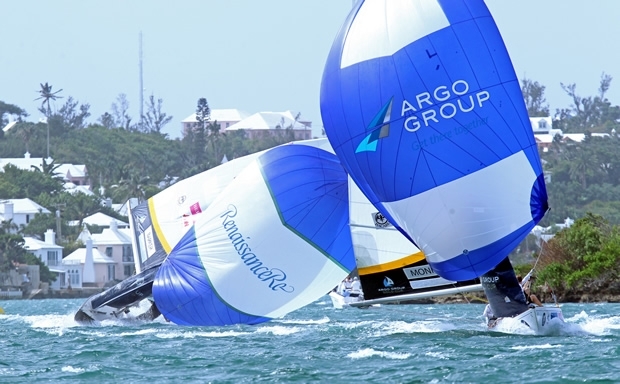 The penultimate event of the World Match Racing Tour, the Argo Group Gold Cup commenced today with wind conditions that kept crews on their toes and will keep the repair crews up late tonight. The early leaders in the US$100,000 match racing regatta, an event of the World Match Racing Tour, are Eric Monnin’s Team SailBox and Taylor Canfield’s US One. Monnin won three of his four races to top Group 1 with 3 points and Canfield leads Group 2 with 4 points. Each group is slated to sail seven races in Qualifying. “I’m very happy with how we went around the racecourse,” said Monnin, last year’s runner-up. His crew won against Barker when the breeze was the strongest and Barker’s crew had to douse the spinnaker because they were struggling tocontrol the boat.“We’re not known as a heavy air crew, but we have a lot of experience racing here and today it paid off. It was important to have a good start because in the big breeze it’s very hard to slow down if you’re too early to the start line,” Monnin said. One member of Monnin’s crew is Frenchman Mathieu Richard, the 2007 champion who has a fine touch in the IOD. Richard hasn’t done a lot of match racing this year, but Monnin convinced his friend to crew for him and it could make Team SailBox a dark horse contender. “It’s nice having him in the crew,” said Monnin. “He has good suggestions and I can rely on him when I’m not confident about a decision. I’m very happy to have him here. ”The wind abated to 16 to 20 knots by the time Group 2 took to the water in the afternoon, but Canfield came out firing. He’s the only skipper in the fleet to finish in the top three in each of the past three Argo Group Gold Cups, including winning in 2012, and today he used a combination of boat handling and penalties to complete the day with a perfect score. Canfield won two races by getting penalties on his opponents. Against Denmark’s Nicolai Sehested in Flight 3, Canfield trailed around the racecourse but got a windward-leeward penalty on his rival just before reaching the two-boat length circle to the pin end of the finish line. Had Sehested gotten to the circle before the penalty, he would’ve been entitled to room to finish and might’ve won the match. Racing is scheduled to resume tomorrow morning at 0900hrs (ADT). Group 2 will head out to complete their three flights, followed by Group 1 at approximately 1200 hrs. The wind is forecast to be lighter, but the action should be just as furious.